Being kind is one of the most important things we can do. Allah (SWT) has commanded us to be kind to others at all times. During the month of Ramadhan, the reward for each good deed is multiplied, so the reward for each kind action is also multiplied. To help children practice kindness during this blessed month, we decided to use a Kindness Jar. 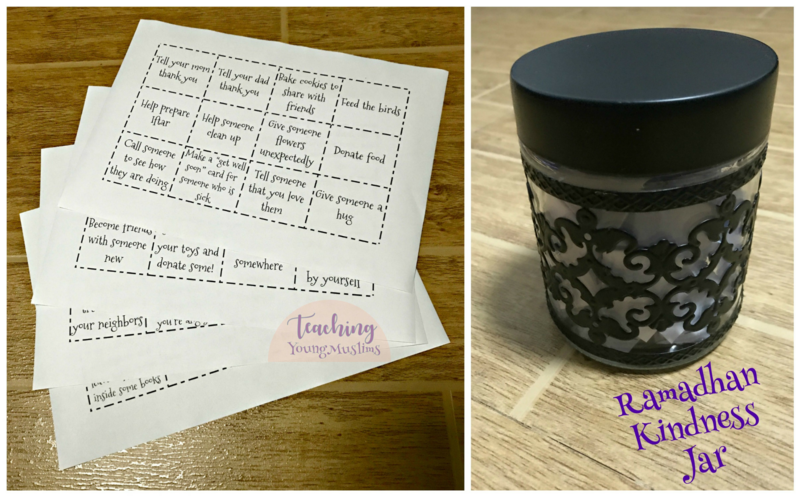 In this jar, we have placed various things that we can do to be kind to others, whether family members, neighbors, friends, or even strangers. Some of the activities are date-specific, like for Eid or to welcome Ramadhan, but the rest of the activities can be done throughout the month. There are 48 activities in total, and you can choose which you feel would be most appropriate for your kids. Some activities are intentionally in there more than once. After you download the activities, all you have to do is cut them apart and put them wherever you’d like. I put them in a jar, so we can choose activities at random, but you can assign activities to specific days too, like in a Ramadhan calendar. If you have more ideas for kind deeds, you can always add them in. To download this list of kind activities, go to the Teaching Young Muslims Resource Library! Enter your name and email address here to receive the password to access these downloads.